It's really exciting to have found and joined the FIRE Community. If you haven't heard of it, the acronym stands for Financial Independence, Retire Early. However, the first part of obtaining financial freedom (the FI part) is by far the most important. The second part about retiring early really should just be called, having the option of being able to retire early, if at all as without thinking about theses concepts now, you may never have enough money to retire, ever. So even though there is a lot of criticism and naysayers, if not downright haters of the F.I.R.E movement, overall it's a great thing to strive for and everyone reading this should strive for the flame, the carrot or whatever you want to call it. Most people either don't think about retirement at all, or start thinking about it too late. What's amazing about the FIRE Community is the fact that it encourages people to start planning now, and with a few small tweaks like managing your budget, saving more, and increasing the amount you invest, even normal people can use the power of compound interest to become financially independent, which is when you or your family has saved up enough money to live on without having to rely on working for income. Financially independent people use the assets they've invested in to produce enough cash flow to cover their expenses. 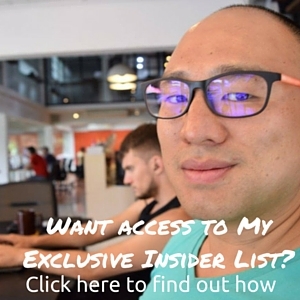 In this post I'm going to breakdown the numbers behind the 4% rule, explain how FIRE works for entrepreneurs and digital nomads, and why location independence and arbitrage is the best hack to hit your goals quickly. It's a bit strange as I accidently hit my financial goals by doing many things right, way before I had ever heard of the term or of the movement. Now you see it all over the news, blogs, and posts, many of which was popularized by a guy named funnily named Mr. Money Mustache. But the way my story started is the exact reason why I'm so passionate about sharing it now, as it almost didn't happen. I never thought of saving money or retirement, or even that much about earning more money. I was your classic American living paycheck to paycheck and living outside of my means. The funny thing is, no one that's living above their means actually realizes it or admits that they are. I thought it was normal to spend 1/3 of my income on rent, as it's what everyone else was paying. I also thought it was normal to have a car payment, and to always upgrade to something bigger, more comfortable and luxurious ever four years as I got older. I also thought it was completely normal to max out my student loan debt and graduate university with $30,000 in debt. The only saving factor was that I grew up with a frugal father who instilled some of those values in me. I also got lucky when I stumbled upon Tim Ferriss' 4-Hour Workweek book back in 2007 and decided to move to Thailand. I had no savings back then, just the money I got from selling my car, furniture and belongings. I got a job making $600 a month taking people scuba diving and learned how to live on an ultra tight budget. 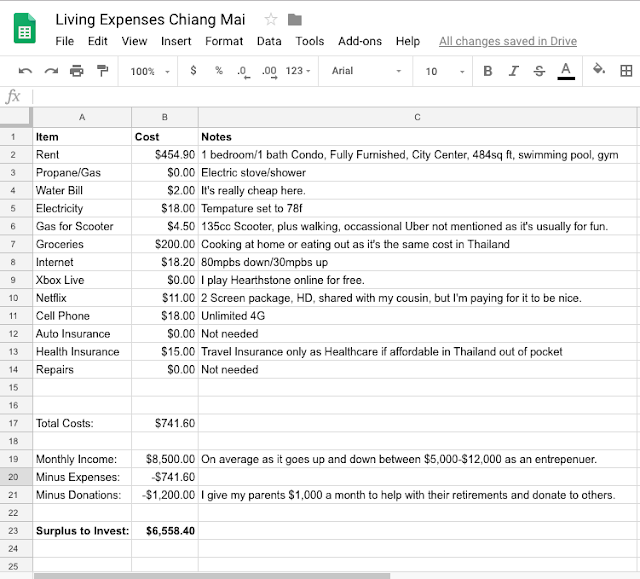 I ended up writing a book about the entire experience titled: 12 Weeks in Thailand: The Good Life on the Cheap, which you can find on Amazon or through the link. It wasn't until years later that I realized I need to earn more money or risk being unhappy and needing to work for the rest of my life. My next four years were spent learning how to increase my income and build online business. 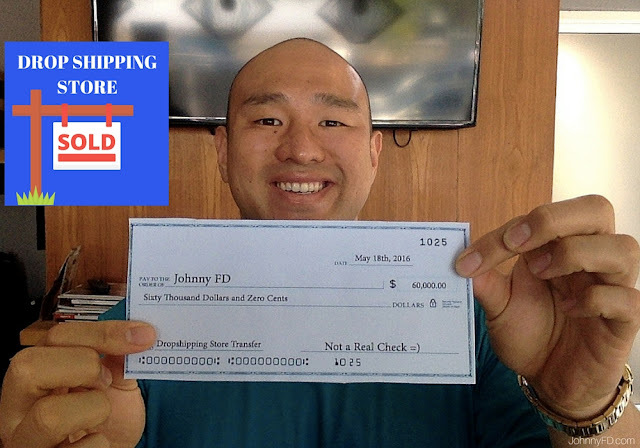 I started making between $2,000-$7,000 a month from running these online stores and ended up selling them for a lump sum after a few years. In total I made around $180,000 in profit which I invested all of it into low cost index funds through a company called Vanguard. That combined with keeping my expenses lower even though I was now earning more money allowed me to increase my savings rate from 10% to often over 50%. A good way to think about the math is that if you are saving 10% of your income, it'll take you 10 years to save up one year's worth of living expenses for when you stop working. However, if you increase your savings rate to 50%, that means that not only will it just take you 2 years, it also means that in 10 years you'll have 5 years saved, and because your expenses are so much lower, you'll need less overhead as you retire. The easiest way to wrap your head around it is with the multiple of 25 as an easy math problem. Take whatever you spend per month right now and multiple it by 25. That number is what is required to require. So if you're spending $5,000 a month right now, multiplied by 25 years, you'll need 1.5 Million dollars to retire, which for a lot of people may seem impossible or unlikely. However, if you're only spending $1,000 a month, like you can do in Thailand, you'll only technically need $300,000 to stop working. Double that if you're living somewhere in America on a super tight budget. Here is what I spent living in Chiang Mai, without worrying too much and still enjoying life, eating out, paying for a gym and a nice condo by the month. The math behind saving money and taking advantage of compound interest to retire as a millionaire is actually a lot simpler than people think. 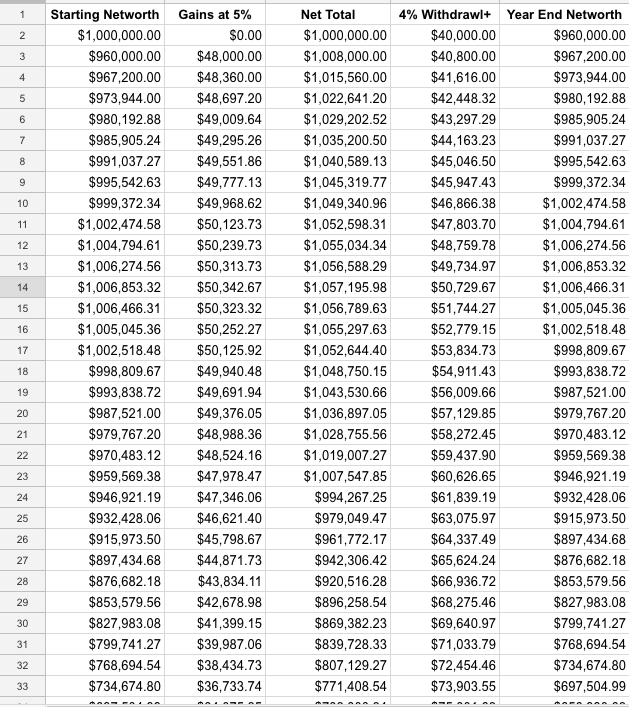 I guarantee that every single person reading this blog post right now can retire as a millionaire by just investing $1,000 a month instead of spending it. If you think that's insane or difficult to do, you're wrong. As an employee living in California, sure it's really difficult to save $1,000 a month. I know it was for me as my goal was to simply save $300 a month and it was almost impossible, especially when you factor in both California and Federal taxes. To save an extra $1k a month, you'd essentially have to make an additional $2,000 a month which isn't very easy to do as an employee. However as location independent entrepreneurs or digital nomads, we have so many tax breaks as well as opportunities. To increase your online business from $3,000 a month in profit to $4,000 really isn't that difficult to do. If you had an ecommerce store it could simply be as easy as optimizing your site and sales funnel to convert visitors to customers just a quarter of a perfect bit better, going from 1% conversion to 1.25% conversion. Or you could simply add more products, find a new advertising channel, etc. I'll be giving a full talk about this at the 2019 Nomad Summit in Thailand along with 6 other speakers talking about starting and leveling up your online business. 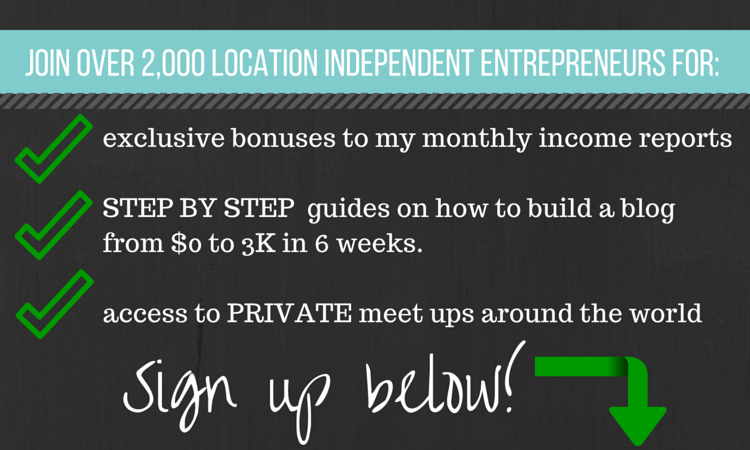 Check it out if you want to learn and grow as an online business owner and take advantage of location arbitrage. 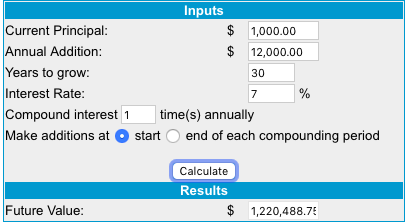 Below is a quick calculation on how just $1,000 a month can turn into a million dollars with the power of compound interest. Below that is my talk on how to make more money by starting then scaling up your business. There's a ton I could go into here, but in general, the rule is, put your money into a low total stock market index fund like the ones Vanguard offers and hold it for the long run. Historically, the US stock market has returned on average of about 11% even with all of it's ups and downs. What normally kills most mains are high fees that a lot of financial advisors or mutual fund managers charge, or when people panic and sell early. I know it's a lot of reading material, but it's your future, and it's worth it. For me, I mostly follow the traditional route of Vanguard index funds and have most of my money there, but I also like to be a bit diversified just in case. 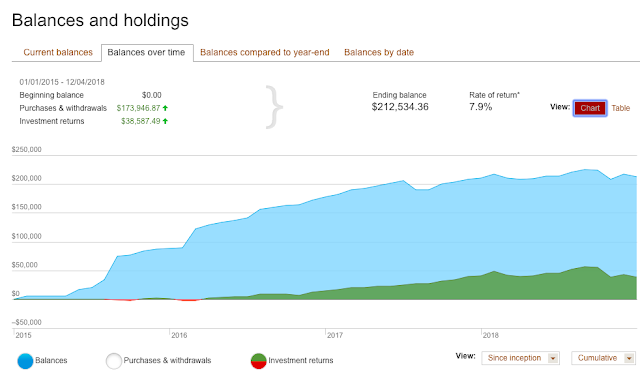 The one big downside of the FI investing model is that people spend way too much time thinking about how to save a few dollars, and not enough time thinking about how to make more money, or even how to invest it. That's where the Invest Like a Boss podcast comes in, that's where we look at other online platforms, and funds that produce 7-13% returns, while keeping us diversified. I personally don't think that the US is going to be the biggest economy over the next 30-40 years so there's no guarantee that the stock market is going to continue to increase by 7% or more each year on average. But Vanguard is still a fantastic way to start, which is why a lot of my money is there. 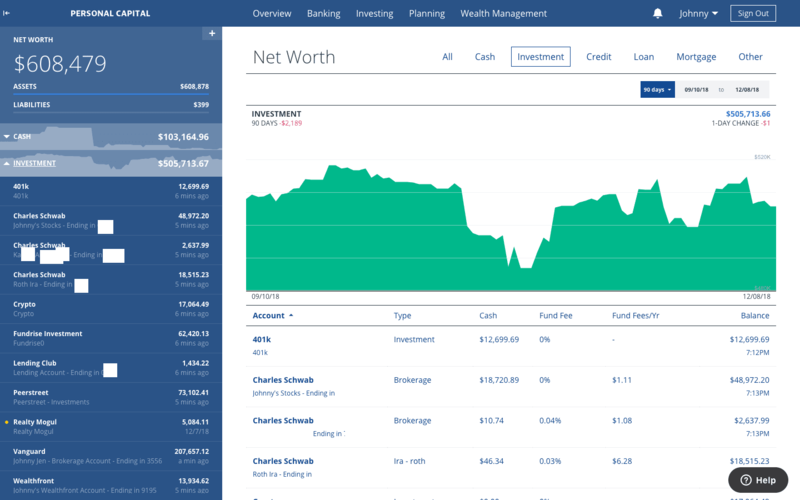 See my personal dashboard below for my investment timeline, when I was putting in $3,000 a month from 2015 and where I am today, even with all of it's ups and downs. If you still don't quite get the math behind achieving FI and retiring early, don't worry, a lot of people get a bit stuck here. But once you figure it out and get the financial ah-ha moment, you'll never want to go back. Neither the 25x or the 4% Rule is perfect, but it's good enough to use as an easy way to set goals. The truth is, nothing in the world is set in stone and no one knows what will happen in 30 or 40 years anyways. But in general, once you stop working, you'll be able to comfortably withdraw 4% of your total net worth each year without your money running out and even give yourself a small raise each year to keep up with inflation. 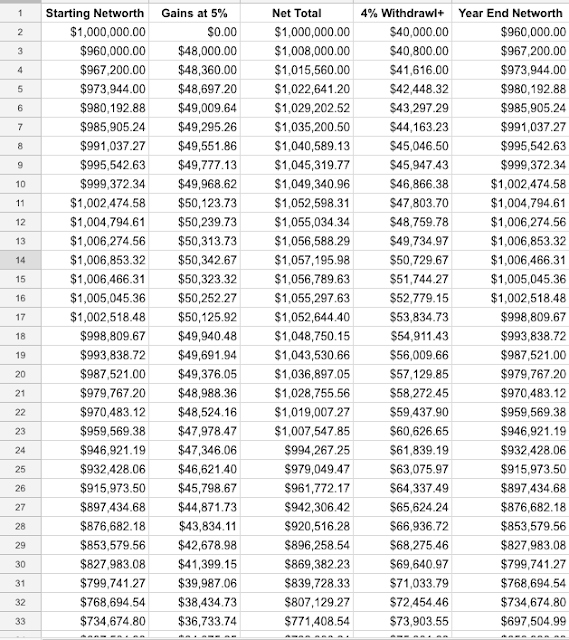 Using the spreadsheet I created below as an example. If you saved up 1 million dollars in total savings and invested it all, how much you'd have per year to live off of and how long it'll last. 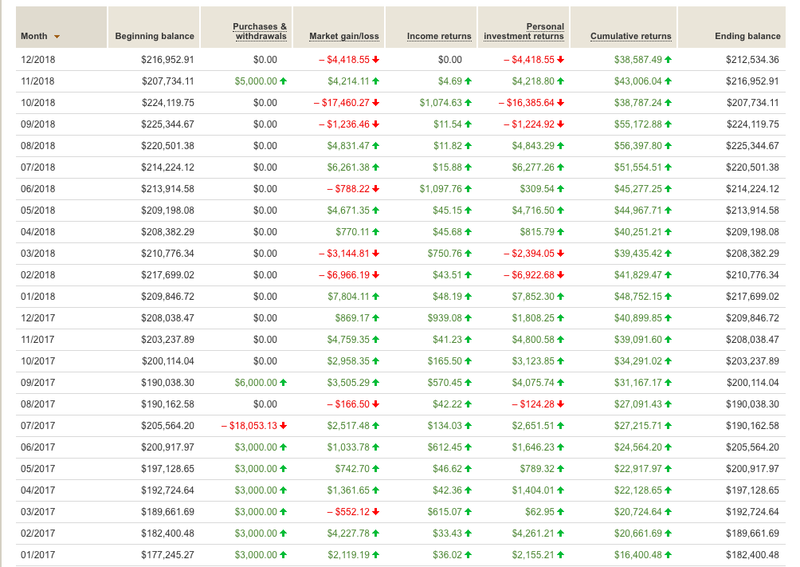 There are a ton of online calculators that will help you calculate this, but having done it in a spreadsheet has forced me to really understand the numbers, formulas and it gives me a very detailed year by year look at how much my money would go up or down if I withdrew 4%, adjusting it for inflation and continued to see the money grow. First off, doing the simple calculations using the 4% rule isn't guaranteed as no one can predict the future, and even using historical data, it isn't guaranteed. The good news is that even with running a historical simulator, we are more than often ahead as long as we invest in low fee index funds like Vanguard Total Stock Market funds. After 30 years we have a 94.9% chance that our initial investment of $1M still exists or has grown and after 40 years we have an 85.2% chance that we still have money in our account or are now even wealthier than we started. The fact is, even if we did retire early and we eventually ended up running low or out of money after 25-40 years, we still have options. We're not living in times of the industrial revolution where the only jobs for someone in their 60's or 70's is manual hard labor. With the advent of the internet if we wanted to, we could easily still work from home or freelance even in our old age. However the real trick is, don't think of early retirement as a permanent thing. Think of it as a freedom pass where you now have the option of not working for as long as you wish, and can focus on things you actually enjoy doing. 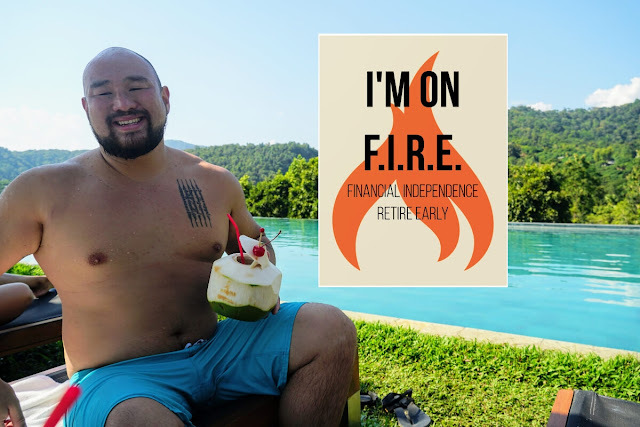 For me, when I hit my first FI target and retired at 35 years old, I stopped working for almost a year, tried surfing in Bali, scuba diving in Komodo, and traveled around Europe for the summer. But eventually I got bored and realized that it wasn't just about me. I wanted to earn more money so I could help others, be generous with friends, and retire my parents as well. Now I continue to start new businesses and work, but I do it because I want to, and because I enjoy it, not because I have to. So don't worry about my money running out, because as long as I continue to live below my means, withdraw less than 4% of my total net worth annually, and stay invested, there's little to no chance I will ever run out of money, especially since I keep adding to it. After 40 years there's an 85% success rate. It's been a crazy last couple of years but it's also been some of the best decisions I've ever made. I easily could have swayed the wrong direction and either went my entire life living as cheap as possible without increasing my income or investments. I also could have went the other direction and not thought at all about saving or investing and just spent it all as I made it. I'm really lucky to have read the right books, met the right people, and have had it all line up for me to have created this life and balance. Right now my biggest problem is that I actually have too much cash on hand to invest it in something other than my Marcus account which is earning 2.05%. I need to jump back into investing or just out it all into an index fund. But either way, it's a good problem to have. I'd love to hear from everyone reading this what your goals are, and what your FI number is. 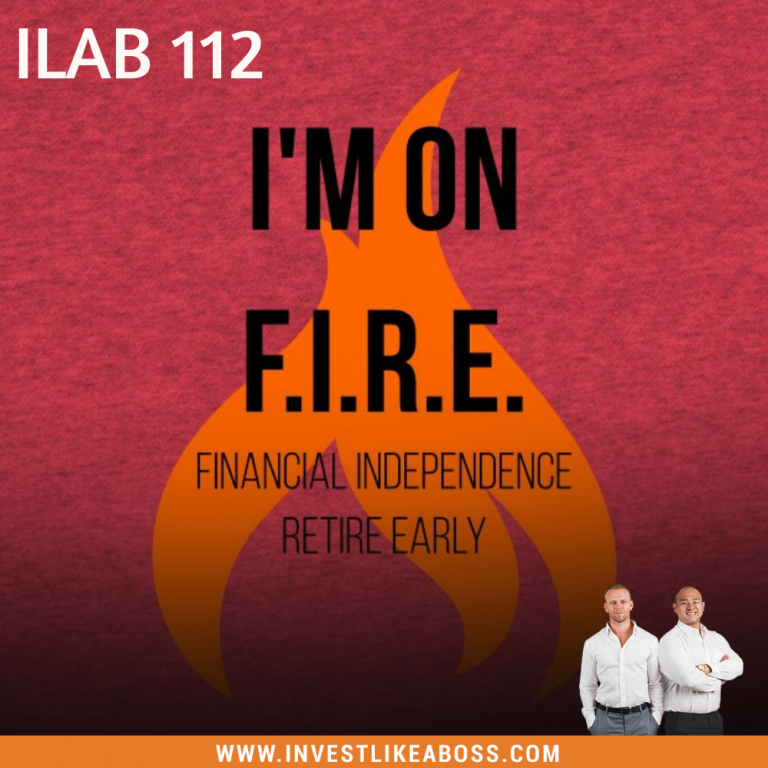 I recently recorded an episode with Sam Marks on Invest Like a Boss Episode 112 so take a listen for the full details. Below is a screenshot of my dashboard where I keep track of my total net worth. If you're in the US you can use my link below to make a free account and give me credit for referring you, but it's something I personally use and love how easy it is to see it all in one place. Feel free to ask any questions here, i'm happy to help!